The votes for Brexit and for Donald Trump are the result of some Russian plot but are a necessary rebellion against a corrupt neoliberal globalist order just one of whose crimes is the economic strangulation of Greece. It’s a typical winter’s evening in Athens. This has been a cold winter, and the air is brisk. And wherever I go, the sweet smell of “success” is in the air. By “success” I am referring to none other than the vaunted “European dream,” and the “success story” of the Greek economy, as described by Greece’s former prime minister Antonis Samaras in late 2014, and as often repeated—even if not in those exact terms—by Greece’s “first time left” prime minister, Alexis Tsipras, far more recently. That scent of success comes from the noxious fumes of the fireplaces and makeshift furnaces which newly impoverished Greeks have lit to keep warm, since well over 80 percent of households are said to be unable to afford absurdly taxed heating oil for their homes. This piece though is not meant to be about Greece, but about the United States, the anti-Russian hysteria that has taken hold, and the attacks that the newly inaugurated Trump administration is facing from protesters, the media, and the “deep state.” What does all of this have to do with Greece though? Everything. Crisis-stricken Greece represents a microcosm of what is transpiring in the United States and much of Europe today, and offers a useful lens through which to analyse current developments. Living in Greece over the past four-plus years, I’ve had the opportunity to view politics and economics from a different lens, one far removed from warm-and-fuzzy claims about the “European dream” or the utopian vision of “open borders” and “freedom of movement.” Greece is a country which has been ravaged by EU and IMF-imposed austerity, its economy and domestic production decimated by EU rules and regulations such as the common agricultural policy, and a country which has been inundated with far more migrants than it could realistically absorb, even during more prosperous economic times. Indeed, the hypocrisy has been astounding. Greece and the Greek people have been blamed for being “racist” and “xenophobic” to migrants that have entered the country simply due to its geographical location and as a result of wars and conflicts which other countries have fuelled. Greece has been accused of “living beyond its means” when its welfare state was never as well-developed or generous as those of Northern Europe and where average incomes have perpetually lagged behind most countries of Northern and Western Europe. The Greek governments of the post-junta period were accused (correctly) of being corrupt, but the EU openly supports those same political parties (New Democracy, PASOK, and the current governing coalition of SYRIZA and the Independent Greeks, which are home to many ex-PASOK and ex-New Democracy MPs) due to their unabashed pro-EU, pro-Eurozone stance. Greece is accused of not producing anything, when it is during the years of EU and Eurozone membership that Greece’s domestic industry and agricultural production were decimated, as Greece’s market was flooded with German imports and Brussels bureaucrats told Greek farmers what to grow, what not to grow, and where they could or could not export their produce. On a visit to EU and NATO headquarters in 2013 as part of an official academic program, the contempt with which Brussels technocrats viewed Greece and the other countries of the “European south” could barely be contained. We were told that Mario Monti—Italy’s prime minister at the time, who was not elected but instead appointed at the behest of the EU—was the “best thing that ever happened for Italy.” We were told that Mussolini “got the job done.” We were told, in these exact words, that the reasons for the European financial crisis were “Bad design. Bad luck. Bad decisions. Greece.” Or as EU trade commissioner Cecilia Malmström is alleged to have said she “does not receive her mandate from the European people,” and as Dutch finance minister and Eurogroup head Jeroen Dijsselbloem said more recently, the people of southern Europe blew their cash on women and booze and are therefore not deserving of help. Such is democracy and solidarity in the Nobel Prize-winning EU. Therefore, when the referendum result in favour of “Brexit” prevailed in Britain, I was overjoyed. The European Union that I had seen, lived, and experienced was undemocratic, authoritarian, and brutal. In Greece, however, a historical inferiority complex vis-à-vis the “west” fostered an attitude of learned helplessness and dependence on the EU, without which Greece could supposedly not survive. Hence, it was refreshing to see voters in another EU member-state stand up to Brussels. So Germany has been whitewashed and thrust into the role of world leader of peace, justice, freedom, and democracy by the same global media empire which openly and unabashedly supported Hillary Clinton in the U.S. presidential elections and insisted, ad nauseam, that she would easily defeat Donald Trump. The United States, of course, can no longer fulfil the role of so-called “leader of the free world,” in the eyes of the media, because the “fascist Russian agent” Trump is president instead of the honourable Secretary Clinton, who once cackled on TV, “we came, we saw, he died.” Oh, but I forgot, when it’s your guy or gal fighting wars and killing sovereign leaders overseas, it’s okay. That must explain why the “antiwar” movement went extinct right around the time that Barack “hope and change” Obama became president. That must also explain why George W. Bush, whose administration invaded Afghanistan and Iraq on false pretences, has, just like Merkel, been whitewashed, as evidenced by his recent appearance on “Ellen” which we were told would make us “warm up” to him. After all, he purportedly hates Trump and Putin—therefore he must not be that bad of a guy! Similarly, when Obama deported record numbers of illegal immigrants from the United States, when he bailed out banks responsible for the economic collapse of 2007-2008 and refused to prosecute even one of banker but instead prosecuted whistleblowers, when he waged seven wars and dropped over 20,000 bombs from drones and failed to shutter the detention camp at Guantanamo Bay, he too was whitewashed. Indeed, he was awarded the Nobel Peace Prize and gets to dine with celebrity social justice warriors such as Bono, whilst receiving star treatment wherever he goes. When he referred to the “57 states” of the U.S., just like when representative Maxine Waters referred to Putin’s invasion of “Korea,” the media gave a free pass—no “Bowling Green” treatment for them! For those with their eyes open all these years, it is easy to realise that not only were the U.S. and international media subservient and compliant during the eight years of the Obama administration, but they also never hit the Bush administration nearly as hard as they hit Trump. At best, Bush’s “bushisms” served as late night TV comedy fodder, downplaying their seriousness. I clearly remember the same media in lockstep with the Bush administration on the Afghanistan and Iraq war marches, while voices who dared to oppose these invasions were canned in short order, even by the purportedly “liberal” MSNBC. Remember Phil Donahue? Me either. At that time, not only was there a (supposed) “antiwar movement,” but there were also many activists decrying the media’s hawkish slant and the concentration of media outlets in the hands of a few huge corporations. Just like the “antiwar movement,” those voices of dissent against the “corporate media” have shut up now. With the media attacking Trump 24/7, fearmongering non-stop over the “Russian menace” and the “tyrant” Vladimir Putin—whom we are told rivals only Trump in his resemblance to Hitler—and with anyone who dares to support Brexit or the elimination of “free trade” agreements such as TPP and TTIP which would place multinational corporations above any domestic law denounced as a “fascist” and “racist” and “xenophobe,” the very same ex-activists have become the biggest shills and cheerleaders for the very same corporate media which they once loudly decried. Take Brexit as a case in point. Those who chose to take back the sovereignty of their country and to speak out against the unelected supranational German-dominated behemoth in Brussels have been branded as “racists” and “nationalists” and “xenophobes.” These are the “scarlet letters” of today’s “progressive” and globalist age. No one cares that many of these voters are not racist, but are very much concerned about the fact that they do not have jobs or are unable to support themselves and their families with their current dead-end employment, that the economy and infrastructure of their country is crumbling, and that there is additional downward pressure being placed on their wages and on the social state through the importation of cheap, “flexible” labor from countries who have been torn apart as a result of western-imposed war and conflict, such as in Syria. Countries that are, in other words, war-torn and impoverished with the support of the very same people who are clamouring for “open borders” and who are, without a hint of irony, branding their opponents as “racists” and “xenophobes.” Because that’s what it’s all about: foster crisis, force people to flee, and use their desperation to pit them against the poorer classes in your society, to drive wages down and profits up. That’s what the whole idea behind “open borders” and “refugees welcome” and creating the conditions which lead to refugees and the brain drain is all about, in case you haven’t realised it. There are protests, of course. Protests in favour of uprooting populations, creating migrants and refugees, providing them special privileges and decimating the working class and the middle class some more. Protests in favour of the austerity-driven Eurozone and EU. Protests which sprung up like magic the moment Donald Trump became president, when for the past eight years, there was hardly any protest against austerity in Europe, or war and drone strikes in the Middle East, or the record numbers of deportations under Obama’s watch. We’re supposed to believe that tens of thousands of protesters in all corners of the United States, for instance, were able to obtain pink hats in short order and were able to coordinate and to “send a message” to Trump—before he even entered the Oval Office. Here, it is important to remember that there are three components to every protest: what is being protested against, what is being advocated for as an alternative, and who is organising the protest (and what their ulterior motives may be). It’s no coincidence, therefore, that antiwar protests during the eight years of Obama’s reign barely registered a blip on the radar—and were thoroughly ignored by the mass media—but protests during the two months of Trump’s presidency have enjoyed abundant and positive media coverage. 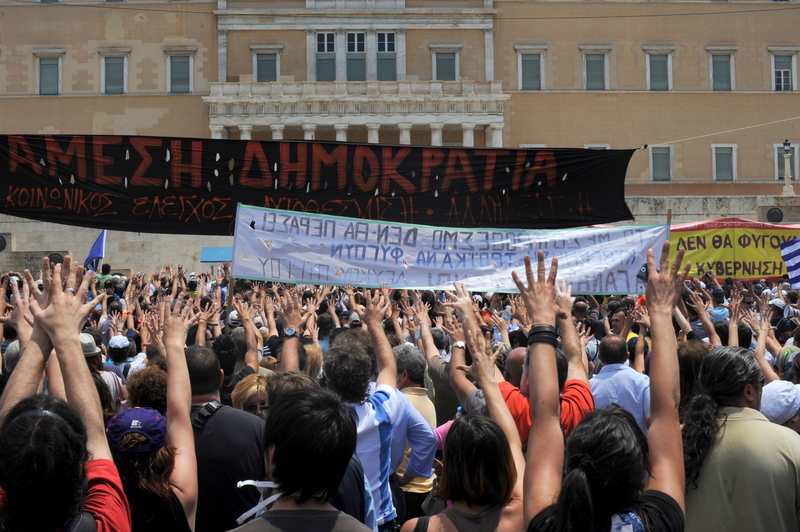 To share an example from Greece, rallies that were organised in the lead up to the country’s July 2015 referendum on accepting an EU-proposed austerity package and which were in favour of a “no” vote drew hundreds of thousands of people, despite having only a few days’ notice of the referendum. Following the referendum, when the “no” vote which prevailed was thoroughly betrayed by the SYRIZA-led coalition government, participation at protests against this betrayal numbered a few hundred people, tops. The reasons should be obvious to anybody with their eyes open. And to add to this, the “leftist” SYRIZA government gets a pass, its betrayal excused away as the result of being “blackmailed” by the EU. In the same breath, SYRIZA’s globalist apologists then tell us that Greece must remain in the EU “at all costs” and what a great, noble thing the EU’s “open borders” and “free movement of peoples” is, and how Greece will collapse and die if it leaves the euro. Political schizophrenia at its finest. If you’re protesting something because you wish to return to the previous status quo, where you turned a blind eye to everything you now claim to be protesting, then you are disingenuous and hypocritical (at best). One should also never forget to also ask, where’s the money and logistical support and the perfectly crafted slogans and hashtags and the massive amounts of pink hats coming from. Answer that and you also answer what is actually being advocated and who is organising these protests. Personally, I’ll never forget the disappearance of the “antiwar” movement after Obama was elected, the support of Democrats and many alleged “progressives” for the bombing and destruction of Serbia and the dismantling of the Balkans (under the watch of Bill Clinton), their blind support of the grossly undemocratic EU and the despicable branding of anyone opposed to it as a “racist” and “xenophobe,” and the silence when “hope and change” was bailing out major banks while ordinary people of all colours were losing their homes and 20,000 bombs were being dropped across seven wars that were being waged. All of this while the media and while most “activist” groups remained silent. Now suddenly Trump is the problem? Anyone who truly is concerned about human rights, instead of blindly parroting the “open borders” and “refugees welcome” agenda, should ask themselves why there are refugees in the first place, and who started and who is perpetuating the conflict that is forcing them to flee. And anyone who is truly concerned about democracy should ask themselves if majorities of people in several countries suddenly became fascists overnight, or if there are other, legitimate reasons why they do not support “free trade” or “open borders” or supranational institutional behemoths such as the EU. To be clear, this isn’t an endorsement of Donald Trump. But it also is not an endorsement of the McCarthyite witch hunt, the media hysteria and scaremongering against Russia, or their pro-Hillary and pro-Obama and pro-EU propaganda. Moreover, it is not an endorsement of the incumbent establishment. What more evidence is needed to see that there’s no such thing as Democrats and Republicans, for instance? There’s an incumbent neoliberal establishment, defended by the corporate mass media and its “presstitutes,” by the military-industrial complex, and by elite billionaires, and there are those who stand in its way, or who are perceived as standing in its way.